Just like you and me cannabis comics, Bong… James Bong: Cannabis Crusader loves the green and red. Especially when it’s a fluffy green with bushy red hairs. Whether you are celebrating Kushmas, highnakuh, or ramadank, there is one tradition in which we can all partake. After all, as Santa said, sharing is caring! 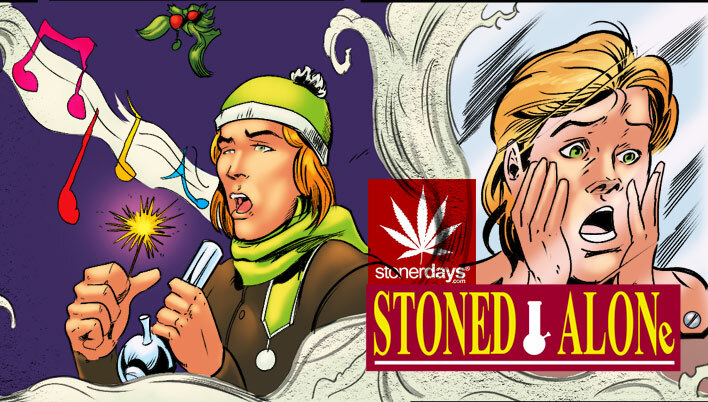 And it’s a tradition that starts today with what is sure to become a Cannamas classic: “Stoned Alone”, a parody of the seminal Christmas Classic “Home Alone”, starring James Bong, in a special holidays edition of the Cannabis comic. As usual, this Merry James tale is produced by an international team of happy little elves in the Nug Pole, and delivered to you via the virtual Stoner Days sleigh! When the rest of the JOINT family leaves James all alone on Christmas to protect HQ, he can’t help himself from taking a peek in Bud’s lab. But of course, he’s not the only one who is after a bountiful stash of trees on the herbiest night of the year! 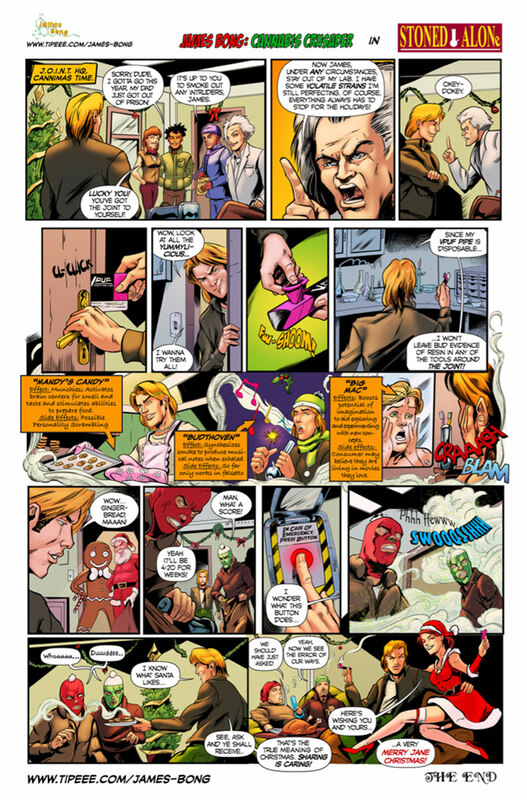 The cannabis comic “Stoned Alone” also introduces a revolutionary new invention, the Vpuf Pipe, which will be the first official licensed James Bong product, coming to top shelves in 2018! Whether you’ve been naughty or nice, it’s okay to read it twice. Or 420 times. Or to your little brother while you tuck him in. It’s sure to be a treat to read as you sit and light your holy joint with the Christmas fire. Merry Christmas to all, and to all a good high! This entry was posted in Featured, Marijuana Art, Stoner Blog and tagged cannabis comic book, weed comics.